In a blender, purée everything except for the sweet chili sauce, green onion and oil. (And the chicken. Don’t puree the chicken.) Pour over chicken in a large bowl and mix with your hands to make sure everything’s coated. Refrigerate for at least an hour (though several would be better, if you have the time). 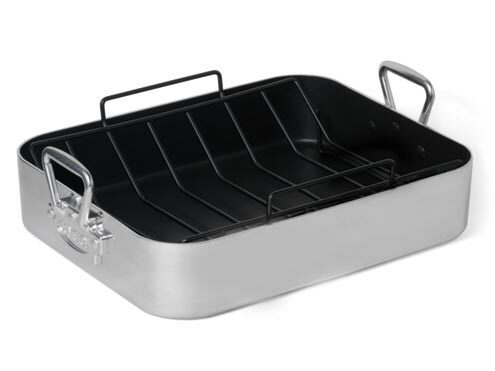 With your oven rack centred, preheat oven to 375 F.
Grease a tin foil-lined baking sheet and place the chicken on it, meaty sides down, making sure they don’t touch. Put chicken in the oven and, after 30 minutes, flip them. When the tops start to brown — which should be after about 10 or 15 minutes more — brush the tops with the Thai sweet chili sauce and broil until the tops start to bubble. Plate and garnish tops with green onion. Served with rice and mango salsa. Recipe adapted from this one, meant for wings and the barbecue. Like the last recipe, roasted duck is another very easy dish to make that looks like you slaved for hours over it. I made one for Thanksgiving and it was by far the easiest dish of them all — easier than the vegetables. Because duck is so fatty, and nearly all dark meat — which is infinitely tastier than white meat — you really don’t have to do anything to make it taste good. This recipe, for a basic roasted duck, may possibly be the easiest fancypants dinner recipe ever. It will also leave you with duck fat — liquid happiness — for future dishes. 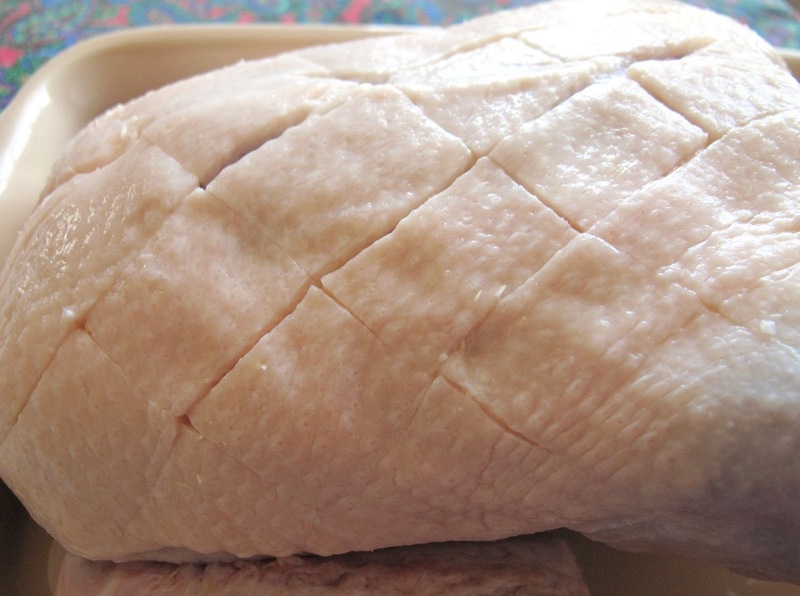 * If you bought your duck frozen, let it thaw in the fridge overnight (and possibly in the sink for a couple hours the day of, just to make sure it’s fully thawed). 2.) Remove the giblets from inside the duck. Sometimes these will come in a neat little plastic package, sometimes they’ll be loose. Some people save these for soups and pates; I throw them away because they terrify me. Rinse the duck and pat dry with paper towels. 4.) Either score it (lightly cutting the skin in a diamond pattern) or poke it all over with a fork, but don’t go all the way through. You just need to pierce through the skin so the (sweeeeet, sweet) fat can escape. 7.) Take the duck out and tent with foil for 10 minutes or so. * SAVE THE FAT! This stuff is heavenly. Just strain it — a cheesecloth works well if you have one; a normal strainer if you don’t — and store it in a jar. It saves in the fridge for months. You can use it for mashed potatoes, roasted potatoes, searing meats. It’s also not as bad for you as you might think, ranking somewhere between butter and olive oil. Rack of lamb is one of those dishes that sound fancy and expensive, but is actually pretty affordable and easy to make. At the store today, there were a number of frozen ones, each seven-rib package ranging from $7 to about $18. The package I picked was $13. Not quite sure of the difference. I used this recipe, but with a few small changes. 2. On a big plate (preferably something like this, with a lot of surface space but a bit of edge) combine bread crumbs, garlic, rosemary, 1 teaspoon salt, 1/4 teaspoon pepper and lemon zest. Toss in 2 tablespoons olive oil to moisten mixture. Set aside. 3. Season rack with salt and pepper. Heat 2 tablespoons olive oil (this is where I used duck fat instead) in a large skillet over medium-high heat. Sear rack of lamb for 1 to 2 minutes on all sides. Set aside for a few minutes. Brush rack of lamb with mustard. Roll in the bread crumb mixture until evenly coated. Cover the ends of the bones with foil to prevent charring. 4. Arrange the rack bone side down on a baking sheet lined with foil and roast for 18-20 minutes. Take it out of the oven and tent it with foil for about five minutes to let all the juices absorb back in. Carve. * For the mashed potatoes, I used two medium potatoes, a couple tablespoons of butter, salt, pepper, dried rosemary and chives, a pinch of nutmeg and 3-4 strips of bacon, cooked and crumbled. Pictured here with baby back ribs and garlic sauteed spinach. 3. Melt butter over low heat, stir in flour. 4. Add milk, stirring often until thick. 5. Stir in most of the cheese — maybe just under 2 cups — leaving behind just enough to cover the tops later. 6. Stir in paprika and dijon mustard — the secrets to excellent mac ‘n’ cheese, IMO. 7. Add macaroni to the cheese sauce. Just making four here. Recipe should yield six. 11. Bake for about 20 minutes, checking frequently for darkened edges around the 15-20 minute mark. 12. When they’re ready, let them cool for five or 10 minutes. Garnish with fresh chopped chives if you want ’em looking pretty. I made these and served them with baby back ribs and garlic sauteed spinach.